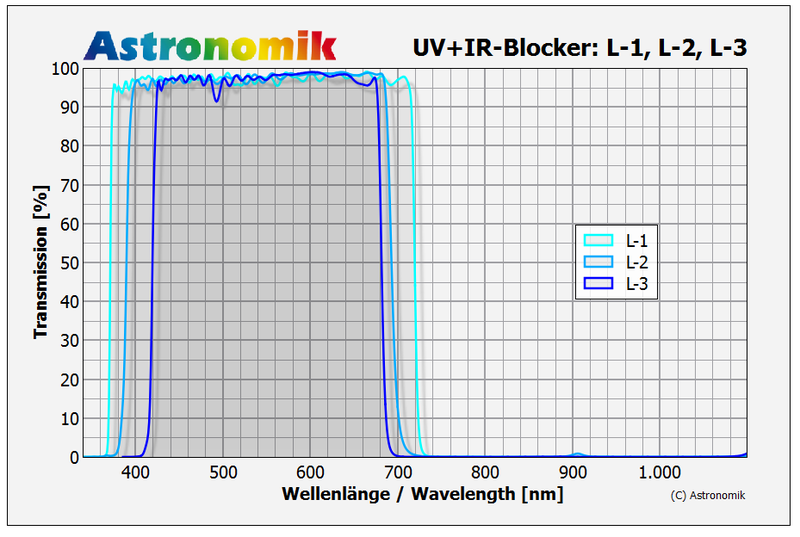 Astronomik now offers you a range of three different UV+IR blockers as Luminance filters. The different spectral window of each new Luminance filters is designed to tune your setup to get the sharpest image from any optical design and any camera. The Luminance channel is probably the most important for a great final image! You want as much signal as possible so the filter should have the highest transmission possible with a wide spectral bandpass. This combination provides the greatest sensitivity and gives you the highest photon counts on your pixels. While the high transmission level is a great aspect of the new Astronomik Luminance filters, not all optical instruments or additional optical elements like correctors, field-flatteners or reducers, have perfect colour correction so it can be the width of the spectral band pass of the Luminance filter that can cause problems. A band pass that is too wide will allow the transmission of incompletely focused light (Chromatic aberration), making stars appear soft or bloated. 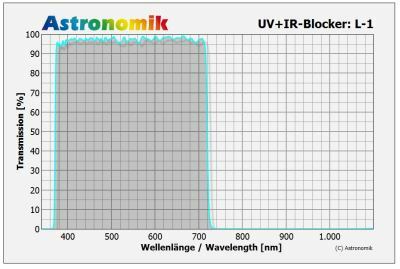 In such cases image processing can become difficult, so having a slightly narrowed spectral window in your Luminance filter can reduce or eliminate this damaging effect. To give you all the tools to gather the best data possible we have expanded our line of Luminance filters: Now you can select a Luminance filter perfectly matched to the kind of telescope you use, to get the highest signal and sharpest image for the Luminance channel! Depending on the color correction of your scope you may use a wider spectral window for the Luminance data. The L1 filter has the widest spectral window, the L2 is about the same as our current L-Filter and the L3 is much narrower. If you use an optical system that is completely free of any chromatic aberration you should get an L1 filter for your setup. For general use the L2 filter is well suited to most optical systems with a corrector, flattener or reducer in the optical train while the L3 filter is designed for users of refractors with a less-than-perfect color correction and in combination with the new Deep-Sky RGB filters, the L3 filter will minimise the problem of bluish halos around stars. The transmission curve characteristics and coatings on the new Luminance filters have been designed and engineered in such a way that no halos or reflections will be visible. Even with bright stars in the field of view you will be able to reveal the faintest structures in nebulas or galaxies. 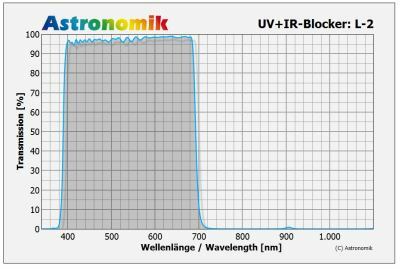 Like all Astronomik Filters, the new Luminance filters are made using an extremely durable and scratch resistant coating, deposited on the finest polished optical substrate, which is free of any striae or internal strains. All substrates are made to exactly the same thickness, so all of our filters are parfocal. If your observing site suffers from light pollution you should try to use our CLS-CCD as a replacement for the Luminance filter. 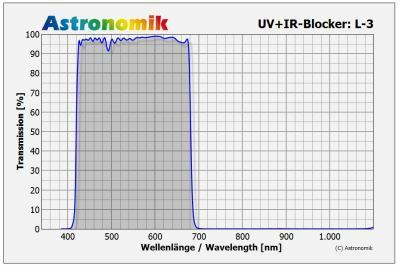 The transmission curve of the CLS-CCD will give you approximately the same amount of energy in all three colour channels while blocking nearly all unwanted artifical light pollution. Customers who replaced the Lx filter with the CLS-CCD are amazed by the increased quality of their data. This small change gives you the opportunity to take much deeper images from your current observing site.